I like being able to support local writers, artist and businesses. With this single book, we have Adam Gallardo from my hometown of Salem, Oregon and Dark Horse Comics based out of Milwaukie. I've been a long time supporter of Dark Horse, and even submitted my first attempt at a script to them oh so many years ago. I met Adam when he was writing 100 Girls for Arcana Studio. He came into my place of business, where I was the assistant manager, wondering if we'd be interested in carrying his title. Adam has come a long way since those days. It's good to see him writing for Dark Horse again, as I was a HUGE fan of his work on the title Star Wars: Infinities - Return of the Jedi. I have a great deal of respect for Adam as a writer. Let me be frank on one point: I've become less and less of a fan of manga as an art form over the past 6 years with the proliferation of title popping-up all over the place. I remember when manga and anime were only able to be found in the back shelves of comic book shops, and now you can find several shelves lined full at your local Borders or Barnes & Noble. I prefer old Robotech and Akira over Naruto, Fruits Basket and Yu-Gi-Oh. The story is basic in its design. You have an alien race that the Earth is at war with, and the human’s defense are large war machines called "Gear". 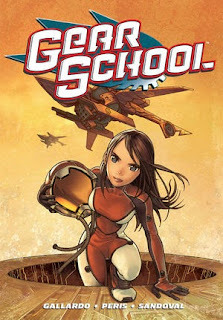 In this, you have your basis from the Robotech series. This story is where these teenagers are learning how to pilot the "Gear" so they can become the next generation of defense for the world. I like this. In this volume, we are introduced to the primary characters, and get a brief glimpse of their school activities. There are awkward social situations and little pieces of teen angst that keep this book light hearted. Of course, like any good beginning of a long term storyline, we are given an opportunity to see what these cadets are training to fight/defend against. The aliens have the typical manga/anime feel, so don't be too surprised. I picked this book up because I know Adam. I read it because I wanted to review it. I praise it because I liked it. This book, and series, will have a permanent placement in my collection. Probably not for everyone, but I think it's well worth trying if you have the chance.